This remnant deciduous treestand provides upland habitat for many urban-adapted species including many birds and small mammals. It’s close proximity to river valley areas also provides linkages for wildlife movement and plant dispersal. There are great opportunities to enjoy this tableland forest on its own or as part of a longer walk that incorporates the adjacent ravine areas. 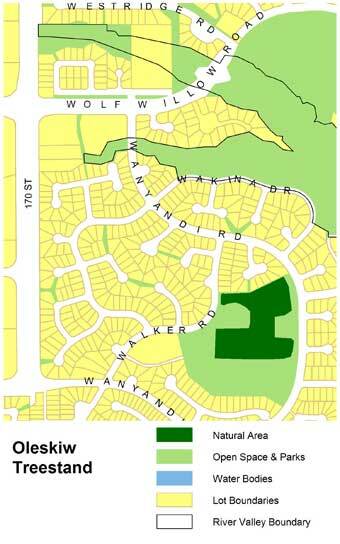 Oleskiw Treestand is located in west Edmonton, west and south of Wanyandi Rd. and east of Walker Rd. The treestand makes up the northern portion of Oleskiw Park, and is open on its south, east and west sides to the rest of the park. A trail bisects the northern and southern halves of the treestand, and there is a playground for children on the east side of the stand. 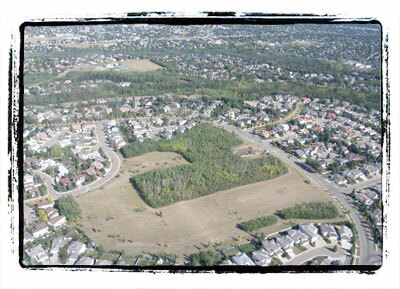 Similar to many medium-sized tableland forests contained within Edmonton’s urban area, this tree stand provides habitat to a variety of bird and small mammal species; however, since this area is in close proximity to river valley and ravine areas, there are chances that other less common animals may also be seen.